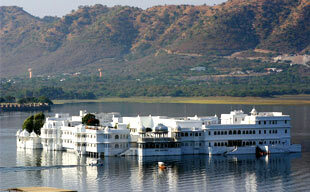 Udaipur in Rajasthan is the city that reflects romance in its purest form. The grand floating palaces, shimmering lakes and lush greens characterize the luxury aspect in the most romantic way. The city is known in the western world with many sobriquets such as ‘Venice of the East’ or ‘city of lakes or white city for its pristine palaces. The two palaces, namely Lake Palace and Jag Mandir Palace in the middle of Pichola Lake offer the surreal views and give Udaipur an unrivalled stature among all royal cities in India. City Palace – The royal palace of the Mewar royal army, City Palace is the star attraction of Udaipur. The splendid palatial complex has two authentic palace hotels and a city palace museum. If tourists are interested in heritage tourism and wish to stay in an erstwhile leisure palace, then city palace is the right choice for them. An added advantage here is the vintage car collection. Do not miss if luxury and heritage are the basic motives of Udaipur City Tour. Pichola Lake and Fateh Sagar Lake – These two dreamy lakes offer luxurious feel and vibe to Udaipur. The signature experiences here include a special boat ride. After participating in the boat ride, we are sure to that you will see the city with a different perspective. Bagore ki Haveli – Located on the edgings of Lake Pichola, Bagore ki Haveli was a minister mansion in the past. Now the structure after restoration is converted into a museum featuring many royal remnants like paintings, royal robes and costumes, traditional Rajashani arts, crafts and motifs. Jagdish Temple – The imposing temple is the landmark attraction of Udaipur city. Situated alongside the entrance of City Palace, the temple is famous for its intricate and carvings. An unmissable sight indeed. Shilpgram – A must visit attraction for Indian handicraft lovers, Shilpgram – craftsmen village is 3 km away from Udaipur is a rural arts and crafts complex. The complex has huts from Rajasthan, Gujarat, Maharashtra, and Goa where artistic brilliance is displayed with great care. If tourists are interested in purchasing Rajasthan Souvenirs, then this is a place to be. By Air – By Air - Nearest airport in Udaipur, Maharana Pratap Airport is situated 20 kilometres away from the city center. By Train - Udaipur is an important tourist destination in rail travel. Trains from major cities in India - Jaipur, Delhi, Kolkata, Indore, Mumbai and Kota arrive in this luxurious city daily. Climate of Udaipur - November to February are the best months to visit Udaipur. The weather is favourably pleasant and facilitates the tourism more easily. Mount Abu – Rajasthan’s only hill station, Mount Abu enjoys a commanding popularity over the whole region. Tourists who come to Udaipur make it a must to visit the mesmerizing hill station for that luxurious time they deserve (distance of 3 hour via drive). Located at the south of Aravali range, the hill station offers expansive views of green hills, and pristine cool environs to enhance the holiday mood. Ranakpur – The Temples at Ranakpur are one of the five holy pilgrimage sites for the Jain community. The temples are renowned for their architectural beauty and intricacy in sculptural designs. Another point to note is the pillar structures. The temple has 29 halls and 1,444 pillars, none of which are similar to each other. Dilwara Temples - The beautifully carved Jain temples built between 11th and 13th century AD made in marble. The center of Jain devotion, dedicated to Tirthankaras also displays the sheer dedication of the carvers.